Sheep are not just 'sheep. 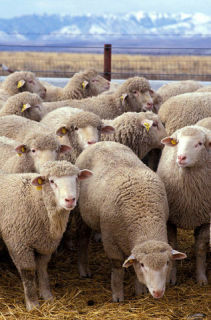 ': image via wikipedia.com Recently a study was published in the science journal PLoS ONE in which genetically modified sheep were put to various discrimination tests, and their performance was compared to that of non-modified sheep of the common variety, Ovis aries. On the way to developing a possible treatment for Huntington's disease, the researchers discovered that sheep are really very smart! The un-modified sheep, your average farm sheep, not only passed a test that is used to assess mental decline in people, but they were able to pass the tests, when even monkeys struggled with them. And these tests were hard. For example, sheep had to choose a bucket based on colors that shifted from test to test; for example, first the colors were blue and yellow, and then the choice was between purple and green. Following the color tests however, the sheep had to switch focus to the shapes and while ignoring the colors of the buckets, though they were still two different colors. These tests, performed by researchers Laura Avanzo and Jennifer Morton of the University of Cambridge, required the use of the animals' prefrontal cortex, a part of the brain that is much more developed in humans than in animals. The researchers said that the sheep were exercising "executive decision-making skills." Michael Marshall, writing for the New Scientist, says it's about time sheep were recognized for their intelligence. He cites their ability to recognize each others faces, have long term friends, group plants by families, and memorize the correct route through a complicated maze. "Sheep are anything but stupid," he writes... "It really is about time we stopped making fun of sheep." I'll add to that: Let's stop genetically modifying them too. That's the baa' for today!